Not to be confused with Swain's Island, Newfoundland and Labrador or Swain Islands. Swains Island ( /ˈsweɪnz/; Samoan: Olosega; Tokelauan: Olohega) is an atoll in the Tokelau chain. 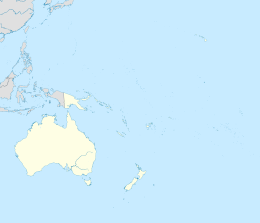 The island is subject to an ongoing territorial dispute between Tokelau, and the United States of America, which administers it as part of American Samoa. Owned by the Jennings family and used as a copra plantation, Swains Island has a population of 17 Tokelauans, who harvest the island's coconuts. The land area is 1.5 square kilometres (0.58 sq mi). Swains Island has also been known at various times as Olosenga Island, Olohega Island, Quiros Island, Gente Hermosa Island, and Jennings Island. Swains Island has a total area of 460.9 acres (186.5 ha), of which 373 acres (150.8 ha) is land. The central lagoon accounts for 88 acres (35.8 ha). There is a small islet of 914 square yards (764 m2) in the eastern part of the lagoon. Swains Islanders mainly speak Tokelauan, making them a tiny linguistic minority in American Samoa where the principal language is Samoan. One major misconception that still sticks to the Western discovery of modern Swains Island is that it was discovered on March 2, 1606, by Pedro Fernandes de Queirós, a famous Portuguese navigator who sailed for Spain. The island that was seen by him on that day, also reckoned by him to lie in 10° 36' S. 171° W., was almost certainly modern Rakahanga, which is in 10° 02' S. 161° 05' W.   The name assigned to his discovery was Isla de la Gente Hermosa, which translates to the "island of the beautiful people" in Spanish. Jennings established a coconut plantation, which flourished under his son, Eli, Junior. Eli Jennings, Senior was also instrumental in helping Peruvian "blackbird" slave ships to depopulate the other three Tokelau atolls—see H.E. Maude's Slavers in Paradise (A.N.U., Canberra, 1981). In 1907, the Resident Commissioner of the British Gilbert and Ellice Islands (then a British protectorate; since 1979 the sovereign nations of Kiribati and Tuvalu) claimed that Swains belonged to the United Kingdom, demanding payment of a tax of US$85. Jennings paid, but he brought the matter before the U.S. State Department, and his money was ultimately refunded. The British government furthermore conceded that Swains was an American possession. In 1953, labor troubles arose on Swains when Tokelauan-hired workers decided to claim " squatters' rights" to the atoll, by virtue of having lived on it year-round. After Alexander Jennings evicted 56 workers and their families from the island, the governor of American Samoa intervened. By executive order, the governor acknowledged Jennings' proprietary rights to Swains Island, while instituting a system of labor contracts and a local governmental structure to protect the rights of his employees. The islanders were also guaranteed a representative in the territorial legislature. During a recent[ timeframe?] visit to Tokelau, Alexander Jennings, representative of Swains Island to the American Samoa legislature, indicated a desire for better trade links between Swains and its neighbor. The head of government of Tokelau, Kuresa Nasau, was reported[ by whom?] to be "interested," and further talks were anticipated. In 2012, Swains Island hosted the DXpedition NH8S; this group arrived on September 5, 2012 and departed on September 19, 2012. A total of 105,455 radio contacts were made. According to the Interior Department survey cited above, Swains Island is governed by the American Samoa "government representative", a village council, a pulenu'u (civic head of the village), and a leoleo (policeman). Swains' officials have the same rights, duties, and qualifications as in all of the other villages of American Samoa. Neither the proprietor of Swains Island nor any employee of his may serve as government representative. Swains' village council consists of all men of sound mind over the age of twenty-four. According to the federal census in 1980, five men fell into this category. Swains Island sends one non-voting delegate to the American Samoan territorial legislature. In March 2007, this office was held by Alexander Jennings. Styling themselves "leaders", or "proprietors", members of the Jennings family ruled Swains Island virtually independent of any outside authority from 1856 to 1925. After 1925, while retaining proprietary ownership of the island, they were subject to the jurisdiction of the U.S. territory of American Samoa. 25 October 1891 – 24 October 1920: Eli Hutchinson Jennings, Jr., (1863–1920) son of Eli, Sr. and Malia (1863–1920) Referred to by Robert Louis Stevenson as "King Jennings" during a visit to the island. 24 October 1920 – August 1921: Ann Eliza Jennings Carruthers (1897–1921) Jointly with sibling, Alexander Hutchinson Jennings; both children of Eli Jr.
1954 to Present: Local government instituted by American Samoa. However, the island is still owned by the Jennings extended family. ^ "What is the difference between nationality and citizenship?". The Economist. Retrieved 2017-07-10. ^ Monmonier, Mark (2010). No Dig, No Fly, No Go: How Maps Restrict and Control. University of Chicago Press. p. 81. ISBN 9780226534633. ^ "The World Factbook". Cia.gov. Retrieved 2014-03-11. ^ "Doug Faunt's Journal". N6tqs.livejournal.com. Archived from the original on 2015-04-13. Retrieved 2014-03-11. ^ a b c "doi.gov". Archived from the original on 2008-05-09. Retrieved 2008-05-09. ^ "American Samoa Company Develops Breadfruit Flour Production Process". Pacific Islands Report. 8 November 2016. ^ "Jump-starting Swains' economy". Samoa News. 12 September 2017. ^ Maude, H.E. (1968). Of Islands & Men. Oxford University Press. pp. 74, 75. ^ Sharp, Andrew (1960). The Discovery of The Pacific Islands. Oxford University Press. pp. 61, 62. ^ "Journal of William L. Hudson, comdg. U.S. Ship Peacock, one of the vessels attached to the South Sea Surveying and Exploring Expedition under the command of Charles Wilkes Esq. 1838-1842. (American Museum of Natural History)". ^ "File no. 811.0141q/14, Central Decimal File of the Dept. of State/Nara". 1914. ^ "Lufkin and Swain family papers..., Bancroft Library, UC, Berkely, Ca. - Banc MSS 68/122 c.". ^ Dehner, Steve (2017). "The "Forged" Discovery of Swains Island: The Nantucket Connection I". ^ a b Page 213 in Jimmy M. Skaggs (1994), The Great Guano Rush: Entrepreneurs and American Overseas Expansion. ISBN 978-0-312-10316-3. ^ Gordon L. Rottman (2002). World War II Pacific Island Guide: A Geo-military Study. Greenwood Publishing Group. p. 83. ISBN 978-0-313-31395-0. ^ "Tokelau calls for return of island". One News. 15 February 2006. Retrieved 15 November 2011. ^ "American Samoa governor ready to resist Tokelau's claim to Swains Island". Radio New Zealand International. 26 March 2007. Retrieved 15 November 2011. ^ "N8S Home Page". Yt1ad.info. Retrieved 2014-03-11. ^ "Te Vaka". www.tevaka.com. Retrieved 2018-04-28. US Dept. of Interior history and description of Swains Island Introduction to Swains Island geography and history. "Memorable events on Swains" 2005 Story from the Samoa News about a 1920s visit to Swains Island. "A queen mother's last wish" Article in the Honolulu Advertiser about the death of Eliza Jennings Thompson, "queen mother" of Swains Island. Alert for Cyclone Percy Gives 2005 population.